Labeled as critical infrastructure by the Department of Homeland Security, the manufacturing of freight railcars in the United States is an often overlooked but essential part of our nation’s transportation security apparatus. 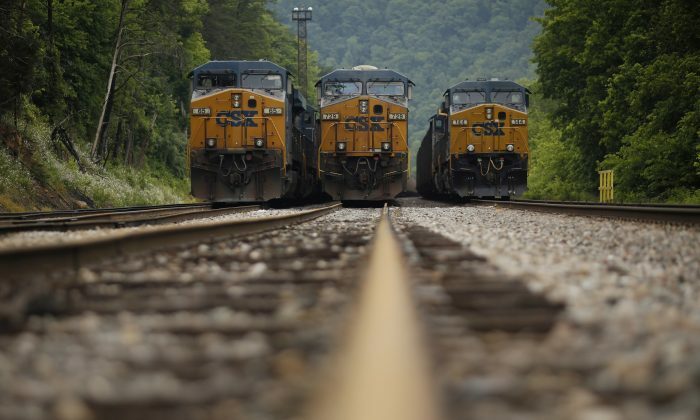 Businesses and government alike rely on America’s freight trains to transport upwards of 5 million tons of goods and materials across the country every day—from agricultural products and military equipment, to nuclear waste and hazardous chemicals. This industry has been targeted in recent years by the Chinese regime, a focus that has major national-security implications for the United States. The China Railway Rolling Stock Corporation (CRRC), a Chinese state-owned rail conglomerate, actively is using Chinese regime-backed financing and investments to underbid global competitors by as much as 50 percent. CRRC is by far the largest railcar manufacturer in the world, controlling upwards of 83 percent of the global rail market. It is more than four times larger than the entire U.S. rail-manufacturing sector and is using unfair financial advantages to pare its costs and import its own finished steel and rail products into the United States. China has made it crystal-clear that it plans to dominate numerous U.S. industries, aggressively targeting not just railcar manufacturing but also advanced manufacturing, robotics, and artificial intelligence through its Made in China 2025 initiative. Within the next three years, CRRC aims to secure $15 billion in overseas orders and establish 11 regional branches around the world. These ambitions put not only the national security of the United States at serious risk, but threaten the economic security of the nation, as well. More than $6.5 billion in GDP and 65,000 American jobs created by the U.S. freight rail-manufacturing industry are in jeopardy. While economic security is vital to the success of the United States, of greater concern is the threat that the Chinese conglomerate poses to our national security, which rests on a healthy industrial base and domestic production of freight railcars and parts, in support of our critical infrastructure. America’s increasing reliance on partial and finished railcars from potentially hostile or uncooperative foreign governments imperils this security. If U.S. railcar-manufacturing capabilities are compromised, we will be forced to rely on countries such as China to supply our military and critical rail-infrastructure needs. In times of increased global uncertainty, this is a risk the United States can’t afford. Railcar technology operates across a vast array of monitoring networks with independent systems monitoring freight and passengers. Within the next 15 years, the Internet of Things (IoT) technology will become increasingly central to our nation’s industrial and transportation needs. By implementing IoT technology into freight and passenger railcars, companies can monitor hundreds of sensors that are relied upon to measure car temperature and load weight, along with remotely opening doors and tracking other metrics in freight railcars. Allowing a Chinese-owned entity total access to technology present on American railcars poses a serious national-security threat, since these vehicles travel through every major city and military base in the United States. The question we need to ask ourselves is if we can trust vital technology and data collection in the hands of a potential adversary? We’ve already seen the U.S. government ban certain Chinese technology companies, with the Department of Defense, for example, banning Chinese-made cameras from military bases and curtailing access by Chinese computer-maker Lenovo. Why have we not yet secured our nation’s railcars and rail infrastructure? The rapidly evolving railcar technology could potentially allow foreign entities access to our devices and data, but their physical presence poses a different type of threat, which is even more serious. Sensitive materials, such as hazardous wastes and military machinery, are transported across our nation daily. These materials are moved solely by freight railcars. Ensuring that this sector is not compromised by new and evolving foreign threats is essential to maintaining our country’s security, now and in the future. Without our domestic capability to produce freight railcars, we would be vulnerable and dependent on China for a critical piece of our nation’s security infrastructure. Congress has recognized the severity of the threats posed by China, especially as related to the critical nature of the railcar-manufacturing industry in the United States. Recently, as part of the National Defense Authorization Act (NDAA), the House and Senate passed legislation that modernizes the Committee on Foreign Investment in the United States (CFIUS), which will increase oversight of foreign entities attempting to acquire critical infrastructure. While this is a major victory, Congress and the Trump administration must continue to step up their efforts in protecting critical infrastructure in the United States. This can be achieved by conducting robust reviews of investments by state-owned companies, creating universal standards for cyber and data integrity when contracting with foreign state-backed entities, and further strengthening Buy America oversight laws. By addressing these measures, the United States can remain one step ahead of China. A strong, vibrant domestic freight-railcar industry has been essential to our nation’s growth, development, and security. With that legacy now under threat, it’s time for our leaders and policymakers to come together around smart, common-sense solutions to protect the freight-railcar market. Our country’s future depends on it. Erik Olson is vice president of the Rail Security Alliance, an alliance of freight rail-manufacturing companies, unions, and U.S. interest groups from across the U.S. rail industry looking to ensure the security of America’s railroad system.